Your best days are ahead of you! Do you feel that your options for an allergy-free life are running out? Whether you need to avoid allergens, take medicines or receive allergy shots- we can help! Our mission at RAAS is to provide the highest quality allergy and asthma health care for our community. 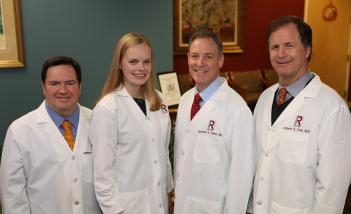 Our physicians are committed to creating an atmosphere of open communication, mutual respect and teamwork. We provide one-on-one, personalized care and treatment of your medical needs. Let our family take care of your family, because what we do matters to you! Existing and new patients can schdule appointments. Maybe you aren’t sure if you need an allergist. Review the common symptoms and conditions below that we treat. Skin testing is a method of testing for allergic antibodies. We will introduce small amounts of suspected allergens into the skin, noting the development of a reaction. The results are read 15- 20 minutes after the application of the allergen. Interpretation of skin tests requires the allergist’s skill in matching the results with the patient’s history of allergy-like symptoms. We offer a wide range of allergens for testing, including foods, environmental inhalants, and select medications. What you are tested for will be determined after speaking with our providers, based on your history and symptoms. Immunotherapy, or allergy injections, is a treatment used to relieve allergy symptoms of allergic rhinitis (hay fever) or allergic asthma by administering injections of substances such as pollen, mold spores, dust mites, animal dander and insects to which an individual has been found to be allergic by skin testing. The injections build up a patient’s immunity to allergens and generally, patients find a substantial reduction of their symptoms and need for medication. You should consider immunotherapy if you are unable to avoid specific allergens, frequently miss school and work because of symptoms, and/or get inadequate relief from medications or experience troublesome side effects from those medications.